4/12 Les Winan Continued excellence despite the lack of a natural ending. The core cast has grown into their roles nicely. 24/123 David Mumpower I never agreed with people who felt the first half of the book was too slow, but the movie lacks the appropriate level of oomph. They have saved -everything- noteworthy for the finale. 86/190 Max Braden As cold and slow as a glacier. The was like watching The Road with magic wands. I did like the story of the three brothers a lot. Not too long ago, the Harry Potter franchise surpassed $5 billion in box office, making the six J. K. Rowling adaptations thus far the most popular movie franchise ever, toppling James Bond from its long held throne. With the series of books now completed and in release, all that is left is for the seventh and final novel, Harry Potter and the Deathly Hallows, to be given the big screen treatment. The trick is that the novel contains 600 pages worth of character development followed by roughly 180 pages of white hot action at Hogwarts. Warner Bros. evaluated the situation and determined that unlike Harry Potter and the Order of the Phoenix, an 896 page opus with several extraneous storylines, Deathly Hallows needed to be given a more reverent treatment. Ergo, there will be two more Harry Potter movies with the former being released in November of 2010 and the latter concluding the eight film series in July of 2011. The debate lies in how to split the story of Harry Potter and the Deathly Hallows into two movies. Almost all of the criticism directed at the final novel involves its almost lackadaisical pacing, including a remarkable amount of previously unseen camping adventures. I always found such critiques nitpicky if not baseless as Rowling has a specific purpose to her decision as an author. Taking the beloved characters of Harry Potter, Hermione Granger and Ron Weasley away from Hogwarts strips them of their identity in a way, forcing a new depiction of who they are as fledgling adults living in the most trying of times. The reader stops seeing the characters as the children we have grown to love over the years and now must re-evaluate them as maturing would-be heroes pressed into action against a foe who has killed parents as well as friends of the trio. Voldemort has been built into the most horrific of foes, someone willing to spill the blood of innocents in order to store his soul in multiple locations. The kids have been lucky in their dealings with him thus far. Now, they must face him in battle and in order to make theirs a believably winnable battle, they have to prove themselves along the way. That journey is one that meanders throughout the world of Muggles who are blissfully unaware of the magical realm that surrounds them. Presumably, this new interaction will be the key to the first movie’s setting. 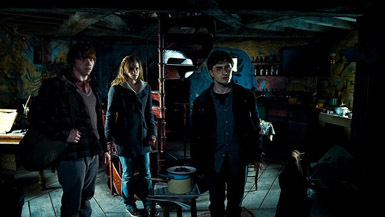 See the latest developments for this project on the Harry Potter and the Deathly Hallows Part I Movie News page.